Crowded, mental, smelly, everyone's eating gross food, spitting, rubbish everywhere, people are sitting in your seat—is it that bad? 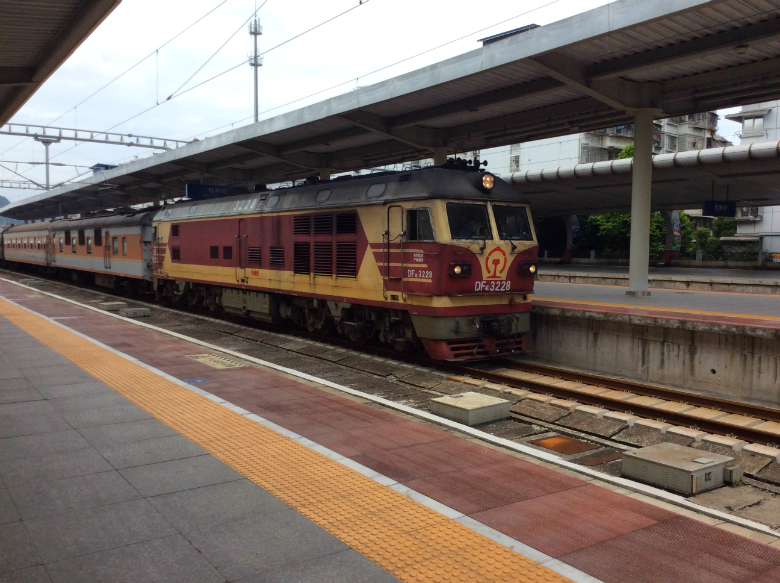 We found out what train travel in China is really like. Our train pulled in to Kunming city at 9pm in the evening. We had been on it for well over ten hours and during that time had experienced a spectrum of strange emotions from the moment we bumbled on board, jamming through the crowded carriage to get to our seats, stressed with big bags and stared at by everyone. We were quickly warmed by the simple offer of help from fellow passengers who made room for us, took our bags from our backs and stashed them up high in the luggage rack. China does this: it forces emotions, pushing outsiders to question and challenge their own staid social conditioning. A scope of pure enraging beautiful madness. 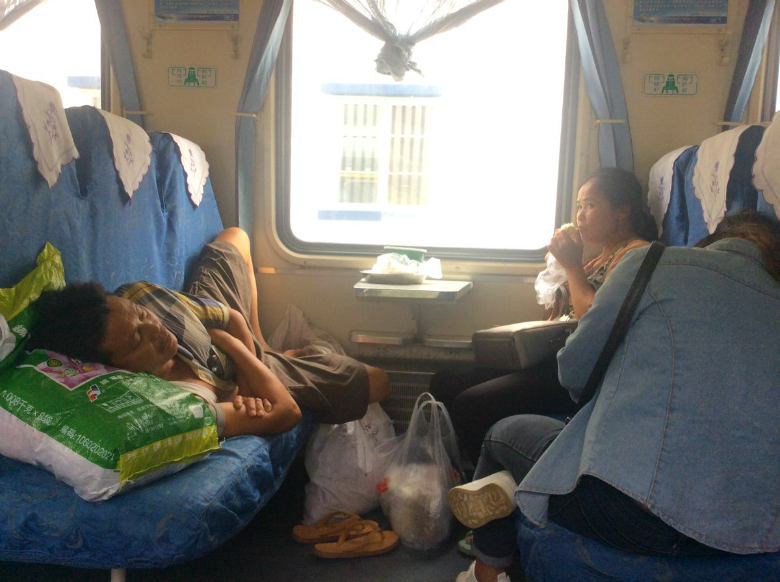 The combination of subtleness, gentle shyness and kindness, mixed with gob-smacking ‘what on earth are they up to?’ mind-boggling-ness was all condensed into this one train journey from Guiyang to Kunming. 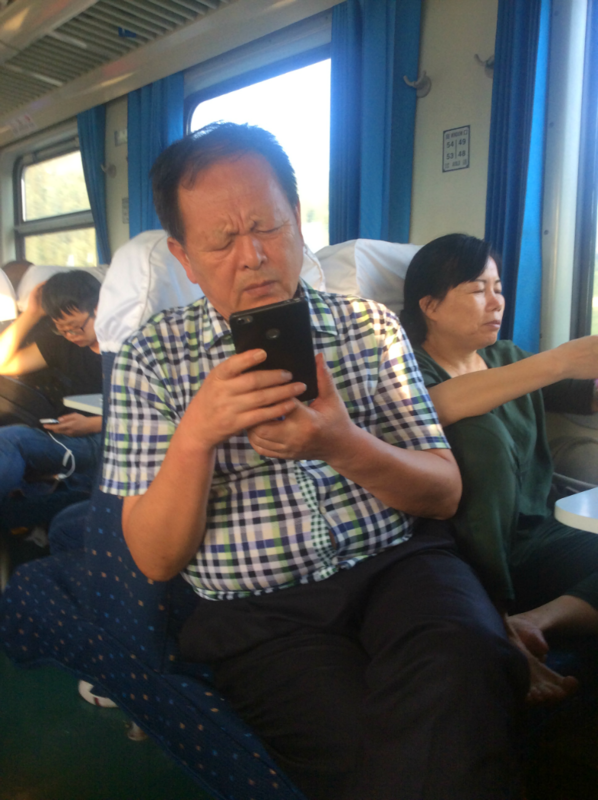 Our time on the train was evocative of what travelling in China is like. Even when we felt like we had had enough of the masses of people, the strange stares, the unruly train stations and the mutters of laowai (literally meaning 'very foreign'), something wonderful and unexpected always happened to make all of the stress worthwhile. Nevertheless it can be exhausting—after hours of being cooped up in a carriage with minimal space, being continually eyed by the people opposite us and then falling asleep only to be woken by the old guy across the aisle who thought he would take his chance to sneak a quick snap of us but forgot to turn the flash or shutter noise off (see above, there he is checking out the picture he's just taken)—you tend to wonder "What am I doing?" But then the little girl who had been staring in fear for a good few hours began to warm to us and we played with her toys together, she'd tell us about them, swapping languages as we played. Towards to final hour of the journey, the fully booked train had emptied out somewhat and a young guy had started a conversation with us about Animal Crossing: New Leaf, which we were playing on our 3DS. The conversation developed to include the guy sat next to him, also a student, who helped with the gaps in English. We spoke about our travels and life in England, fellow passengers bubblingly curious, blatantly listening in, clearly desperate to hear more about what these two pale-faced outsiders were doing on their train. We showed them our British passports; neither of them had been outside of China. The man in the seat behind them, unable to keep his interest under wraps any longer, turned around and lent right over the seat back to have a good look at them too. We showed them what Facebook and Twitter looks like; we spoke about Baidu and about how Facebook wasn’t allowed in their country; they were as eager to know more about our lives as we were eager to know more about them and their lives in China. Our two new mates were strangers to each other. One, let's call him Johnny, was from Yulin – he said it wasn't a nice place. He had a girlfriend but wanted a girl with blue eyes - "like yours," he mentioned innocently. 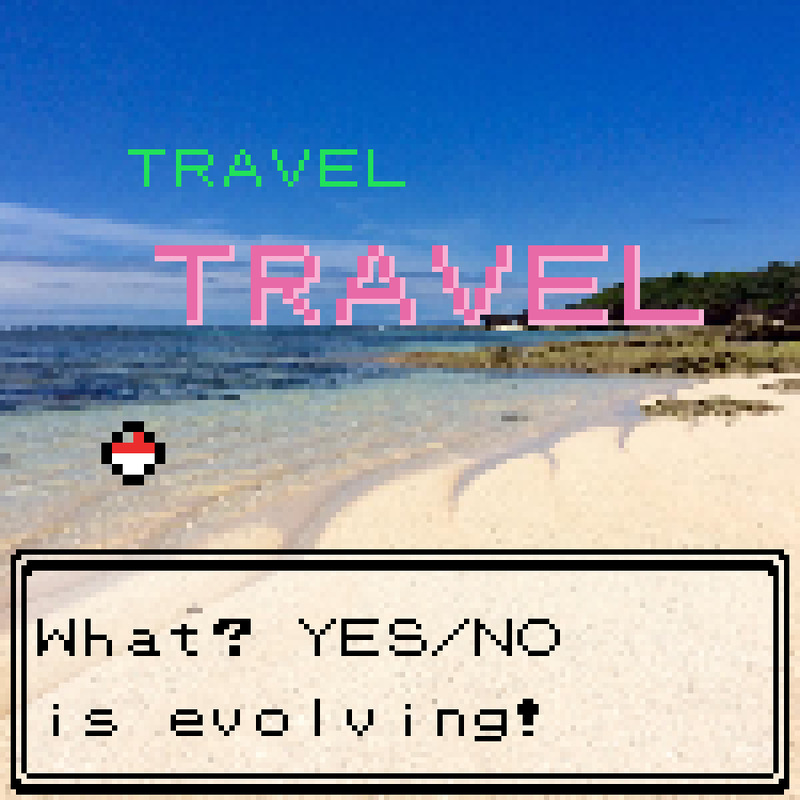 He had dreams of going to other places. The other young guy was also a student, quieter, glasses-wearing and more geeky but very eager to chat. A third guy also joined in. Older than the two students, he was a political lecturer at Kunming University. He seemed to be bursting with ideas and the unsatiated thirst to travel and see more of the world, his strained face and mumbling of "it’s difficult" felt like an allusion to the fact that his job as a political lecturer in a country where freedom in politics is not exactly a given did not allow him to teach the ideas he wanted to, and a wife and children now meant that his dreams of other places were just pipe dreams, long-distance commuting every weekend home from his job in Kunming to see them. 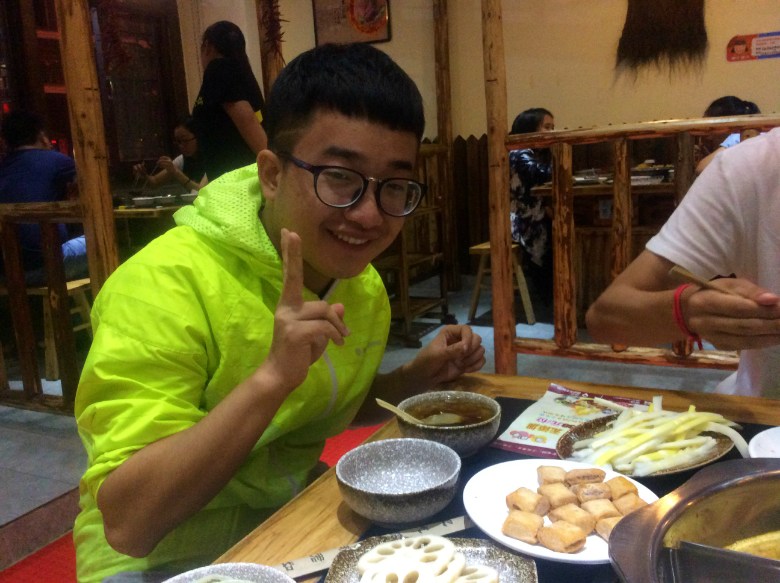 We had met him on a Sunday evening travelling to Kunming for his week of work ahead. 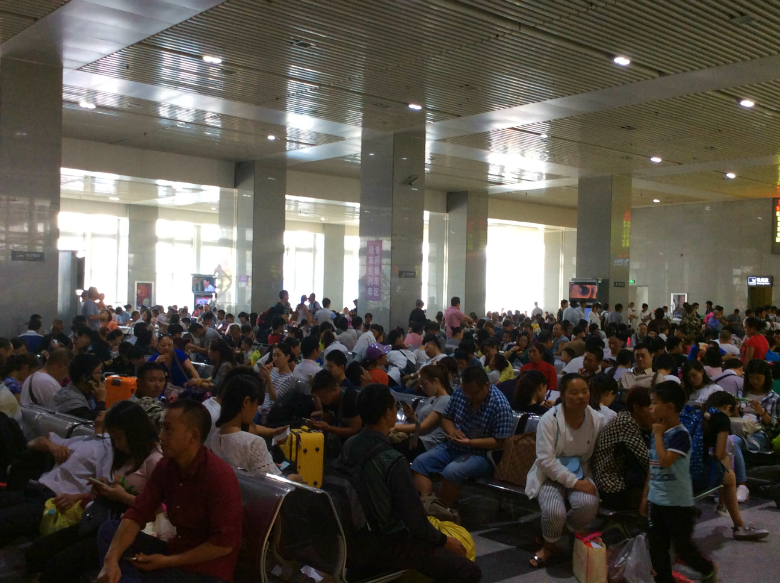 By the time the train pulled into Kunming we had made plans. The four of us (minus the lecturer whom the lads didn’t invite) were off for dinner together. They physically took our bags out of our hands, even our precious rucksack with everything important inside it – laptops, passports, iPad, GoPro, money – and we trusted them. Confidently pushing past all of the taxi touts and out into the city, this was it, our new gang together. The younger guy with round glasses phoned our hotel to let them know we would be checking in late. This was amazing. These guys didn’t even know each other and here we all were, sorting out plans and going to dinner with two alien Westerners they'd met on a train. This kind of thing would rarely happen in the UK because of sheer British awkwardness and stuffy social conventions, but these guys – let's reiterate, strangers to each other – were open and inviting: another incredible instance of the kindness of Chinese hospitality. 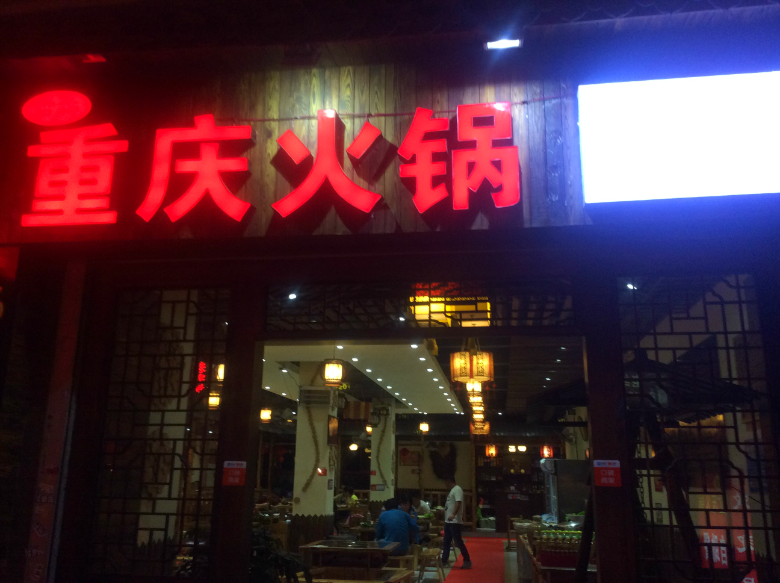 They boys warned us against pickpockets in the area and led us via Baidu maps to a hot pot (火锅, huo guo) restaurant, the kind of place we would want try but wouldn't because there would be no English nor would we understand how it worked. We had tried this kind of communal eating thing in Korea and it often ended in a disastrous dinner. 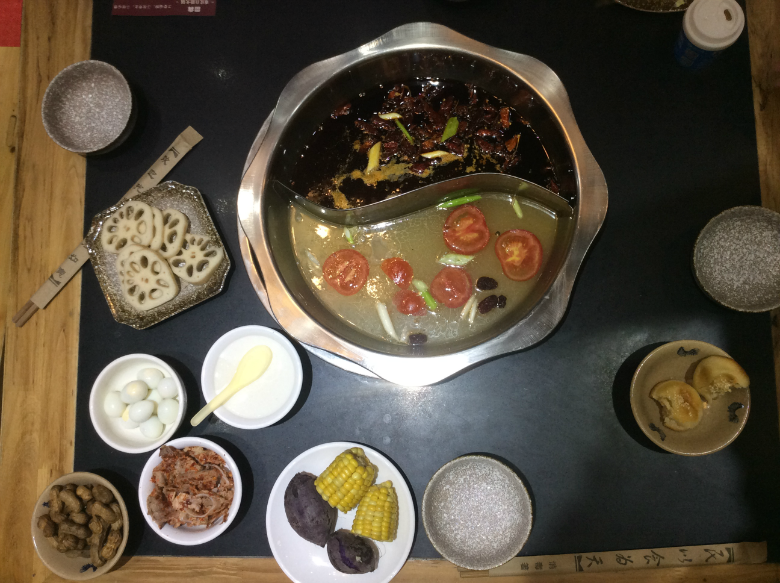 They explained the set-up of the restaurant to us and we tried to follow their instructions: choosing dishes out of fridges and from a long table, taking them back to your seats and plopping them into either the red spicy side of the hot pot or the more herbal "cooling" side. We were seated by a giggling young waitress who helped us stash our backpack burdens. The staff were obviously excited about us being there and asked our new mates if they could have their picture take with us. Unlike the train, this was fun: it was like we were famous. The girls who worked at the restaurant were nervous when it came to actually taking the pictures, so we had to encourage the more fearful to come out of their hiding places and join in. Everyone was enjoying the experience of being mixed up in each other's worlds. 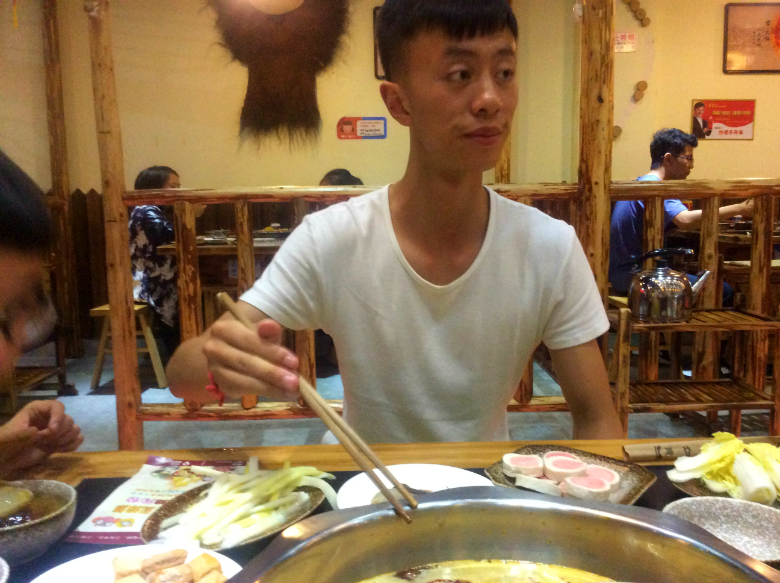 We sat and shared the hot pot together and sipped beer, a practice which we couldn't quite grasp: it seemed that we had to drink in shots, and only when others had their glasses full. The thing was though that after a long day stuck on a train we were thirsty and, combined with the spicy food, the beer was going down too quickly. It became painful to wait for the next shot of cool bubbly lager and it didn’t seem like the done thing to pour ourselves another cup. Chinese and British drinking etiquette differ wildly. Over dinner we chatted together, their English was decent, and with a little help of Baidu Translate were able to have full conversations about their lives, the music they like, Jackie Chan films, what countries we had been to, where we are going, what England is like, what we are doing, who we are. 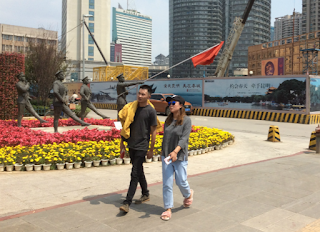 It felt like they had barely ever had the chance to talk to someone from outside of their world—we definitely hadn’t had the chance to sit down with young Chinese people and talk to them about their lives. Johnny however did mention an English teacher at university whom he liked because he was Welsh and swore a lot. Our new friends were aware that in China people weren't allowed to do certain things that in the West we were allowed to do. They were knowledgeable and open and yet they seemed happy and under no illusions. Both of them were heading to Dali on the bus to hang out with their respective friends; it was the summer holidays in China and Dali seemed to be the place to go in Yunnan Province to have fun. They both planned on getting the overnight bus from Kunming which was going to leave at 11pm – all of this after being on the train all day. In the UK a journey of this length would be nigh on unheard of, which gave us a hint as to what it is like to live in such an enormous country. Dali attracts many Western backpackers who head there to take in the natural beauty of Yunnan, meet up with other travellers and party (similarly to also-famous Yangshuo) and that seemed to be exactly what was attracting the young Chinese students there too. The guys told us they were going to Dali to meet different people and have fun, both of them had groups of friends they had plans to meet up with when they arrived. On the train they'd mentioned their plans in front of the lecturer who laughed and said to us, "They have a foreigner street there!" The time came for Johnny and Glasses to catch their bus. We swapped Weibo names, seeing as being friends on Facebook was a no-go, and they put us in a cab to our hotel and waved us off. Neither of them swapped details and both went in different directions: it was just another day and a shared experience that happened and it was nice and that was it. What a whirlwind of a day and what an insight into Chinese life we had been a part of without even exploring Kunming. Travelling by train is by far the best way to see a country, side by side with locals, taking in the views of the land and meeting new people. Now it was time to actually see the city.